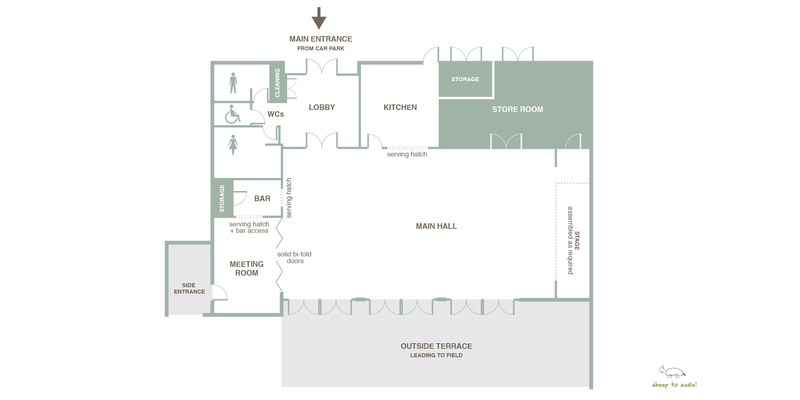 Floor plan for Norbury Village Hall, Shropshire. Floor Plan of the Village Hall at Norbury, Shropshire. Below is the floor plan for the new Village Hall in Norbury, Shropshire. This wonderful new facility includes a conference/meeting room, plus large hall, a well equipped kitchen and much more. The main hall is 18 metres by 9.75 metres excluding the stage area. The small meeting room is 4.4 metres by 6.2 metres. The Village Hall at Norbury, is a popular venue for groups and committees and is also the perfect venue for celebrations with an outdoor terrace with wonderful views of the Long Mynd and Shropshire Hills, a real treat. If you would like to book Norbury Village Hall, current availability can be viewed on the calendar or simply call Anita Bright on 01588 650242 or email us at hello@villagehallnorbury.co.uk. Norbury Village Hall is a wonderful facility for locals living in the Shropshire villages of Norbury, Wentnor, Ratlinghope and Myndtown, however, you are still welcome to book the hall if you live outsides these parishes.